Challenges change from season to season depending on the weather and where you are fishing from, whether shallow, deep sea, fresh water or salt waters. Various skills have to be mastered including reeling fish, boating, holding fish among other skills. Recreational fishing is doing fishing as a sport or as a hobby while commercial fishing is doing the activity for profit. As a beginner, let your focus not be necessarily on catching fish but mastering the basics of fishing and enjoying the outdoor activity as you spend time with your family and friends. Until you have gone out a couple of times, always go out with an experienced fisherman, especially if you have to get a little bit out of the shallow waters into the deep waters. Take each fishing trip as a learning experience, and learn all you need to know on how to get started fishing. There are many types of fishing out there. You can fish while in a boat or do without a boat by fishing on the shores of the waters. We have freshwater fishing, saltwater fishing, fly fishing, deep sea fishing, kayaking, ice fishing among others. Freshwater fishing is fishing in places like streams, rivers, lakes, and ponds, whereas saltwater fishing is fishing in the ocean or sea where the waters have a high salt content. Kayak Fishing is fishing while in a small boat called a kayak. Find the type of fishing that you can begin with. Shore fishing is a great way to start fishing. As a beginner in fishing avoid deep waters which are for seasoned fishermen and choose to fish in shallow waters unless you are accompanied. As you continue with your fishing expeditions, you can get into other types of fishing like deep sea fishing, ice fishing among others. Fishing regulations are necessary because they protect waterways and fish species by making fishing a sustainable activity that will be passed on to our future generations. Each state and nation has different fishing laws and regulations. Get to know the fishing regulations in the state or country where you will be fishing and also for different fish species. 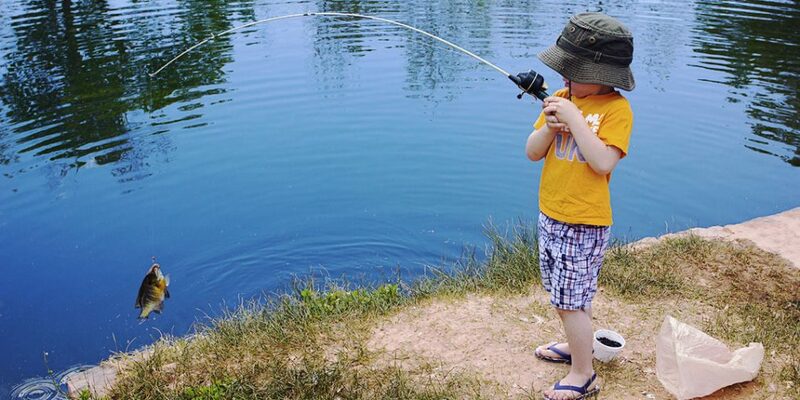 Get to know if fishing is prohibited in some months in the state where you intend to fish. Also, you need to purchase a fishing license. Check the information online. Remember to observe fishing regulations in your state. Please don’t litter, ensure you carry everything you took on your fishing trip. To be a successful fisherman, you need to invest in the right kind of fishing gear. Fishing gear is the equipment used for catching fish and it is also referred to as fishing tackle. Some fishing gears are basic, and you cannot catch fish without them. Fishing gears include nets, reels, lines, hooks, tackle box, lures, fishing shoes, among others. Other fishing essentials are baits, a pair of scissors for cutting the line, sinkers, fish finder, a measuring tape and nose needle pliers which are for removing hooks from the fish. And please remember to carry a fish species checklist, a container for storing your fish, a camera, a GPS, a life jacket, and sunscreen. Here are some of the basic fishing gears you need for fishing. A fishing reel is cylindrical. It is usually attached to a fishing rod. It is for winding and stowing the fishing line. Some special fishing reels get attached to a boat. And a fishing rod is a long pole with a fishing line sustained in place by a fishing reel that the angler spins while casting. At the end of the line is the hook holding the bait. To lure a fish, you need the right kind of hook. Fish hooks are equipment for piercing the fish and holding it. There are many types of fishing hooks to suit different fish species, waters and fishing styles. Some examples of fishing hooks are circle, worm, treble and bait. On the other hand, a fishing line is used for connecting the bait to the fishing rod and reel. It is cast at varying distances. The line also serves to reel the fish in after the fish gets hooked. There are many techniques of fishing depending on whether you are doing fishing as a recreation activity or for commercial purposes. Fishing can be done from the shoreline, river bank, boat or kayak. You will choose an appropriate fishing technique to suit your style and to match the fish species you are targeting and the waters you are fishing from. Floats or bobbers and sinkers are used to keep the bait at the appropriate water level. Bobbers sink when a fish bites a lure. They help you to determine when the fish bites the lure. A tackle box is for carrying and storing your fishing gear. A few basic items should be in the tackle box. They include extra fishing line, sinkers, bobbers, extra hooks, artificial baits, nose needle pliers, first aid kit, sunscreen and a pair of scissors. Learn fish species inhabiting the waters you will be angling from. This will help you to adhere to fishing regulations concerning different species. It will also enhance your fishing trip by making you identify your catch. Print out a checklist to help you identify various fish species using images. Prepare all your gear. Get live bait from a tackle or bait shop or organize to get your own crickets or worms. Set out on your first fishing experience. Prepare your fishing gear for the first cast. Cast your line into the waters and wait for a bite. You will need to practice casting until you master it. Please note that you will need to know how to release fishes back into the water so that they can survive. If you catch a fish that you don’t want to keep, release it back into the water. It will be very exciting to catch fish. The fish need to be kept fresh for consumption. You have an option to keep them alive or frozen(using ice). Then you need to learn how to gut the fish and fillet it. In case you need to keep the fish for days weeks or months, you can store it in your deep freezer. If your parents never introduced you to fishing, it is not too late to get started. Fishing is an enriching activity. Spending time out in the waters is healing and relaxing to your overall wellbeing. You get to spend a great time outdoors with your friends and family and you also get an opportunity to create lasting memories. In addition, you still get to meet other anglers physically and make new friends online by sharing your fishing experiences. What’s more, when you get a good catch, you get to enjoy it.